The mission of the Windber Area School District is to ensure all students the opportunity to acquire the knowledge, skills, and attitudes necessary to solve problems, communicate effectively, and are responsible citizens while preparing for a life of continual growth and learning through a premier educational environment. 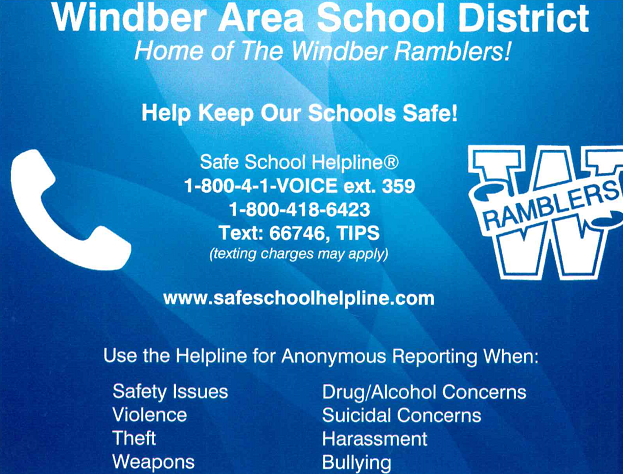 The vision of the Windber Area School District is to ensure that all students have the opportunity to acquire the knowledge, skills, abilities, and attitudes necessary to solve problems, communicate effectively, and be responsible citizens while preparing for a life of continual growth and learning. Develop and administer collaboration between WASD and Assurance Counseling Services to proactively implement wellness initiatives and mental health services for our students and staff. Continue efforts to develop a proactive approach to establish behavioral supports and a social culture to improve student independence, participation, and overall educational quality by implementing School-wide Positive Behavior Interventions and Supports. District-wide implementation of consistent and collaborative data analysis and data-driven instruction to increase the level of Proficient and Advanced level students across all grades and tested subject areas of the PSSA by 10%; and by 2.5% for Grade 11 retake students across all Keystone Exam tested content areas (Algebra I, Biology, and Literature). Implementation of Instructional Technology at an increased availability to support immersion of students and staff through instruction and assessment in a 1:1 technological environment. Continue to monitor and further work to develop previously established goals and construction related items.